First I gave the rendered walls a rub down with No.4 sand paper. The render was undercoated with a white chalky acrylic finish before the color was applied. 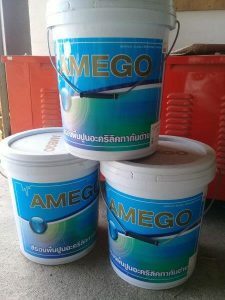 The name of this first coat AMEGO. It can be rolled or brushed and dries very quick. In fact I think it’s a good product that fills small cracks and I used it to undercoat the door jambs which were then sanded to give a smooth surface ready for the white oil paint. The undercoat came in 20 liter drums and were able 1200 baht a drum. This was the middle of the range price and the next up was much dearer. This white chalky paint gave a good surface for the finishing coats. I gave the white undercoat a quick sand paper rub before the final coats. The final coats were the 4 seasons brand, inside and out. Don’t lose the color code as there are so many colors that look alike. The high gloss paint for the doors and fence is oil paint, it seems there is no high gloss acrylic paint in Thailand. The white paint was disappointing as it was still transparent after three coats, I did buy another brand later which seems okay but still not satisfied. A white paint for the ceiling was also very poor quality and I luckily found a 4 seasons brand special ceiling paint, it was simply called 7000. Like most things, you should buy the paint yourself, do the painting yourself or get a price first and be sure the price is for all the coats needed and not per coat. Either way be careful here as a contractor can give a good sized ceiling one coat in less than an hour. When the gypsum ceiling is finished the contractor should give it one coal of paint, that way he must first sand it properly. Again, make sure they know this when they give you a price for the job.